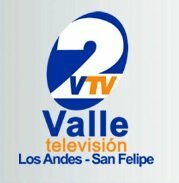 General TV Channel / Valle Television is an open Chilean television channel designed to meet the needs of the inhabitants of the Aconcagua Valley, which includes the cities of Los Andes, San Felipe, Catemu, Llay-llay, Putaendo, San Esteban, Santa María, Panquehue, Rinconada de Los Andes and Calle Larga. VTV has been broadcasting since the end of May 2015 in its digital terrestrial TV signal in the 40 UHF of Gran Valparaíso, in the form of a demonstration signal for this area. With this, the channel, although demonstratively, begins to comply with the dictated in the law and the regulation of the digital TV in Chile, launched from April of the same year, in which dictates that the regional signals should be or encompass 50% + 1 of the regional territory, or in its absence, in the same amount of inhabitants of the region. This signal will be in tests, until VTV is conceived the definitive digital signal.